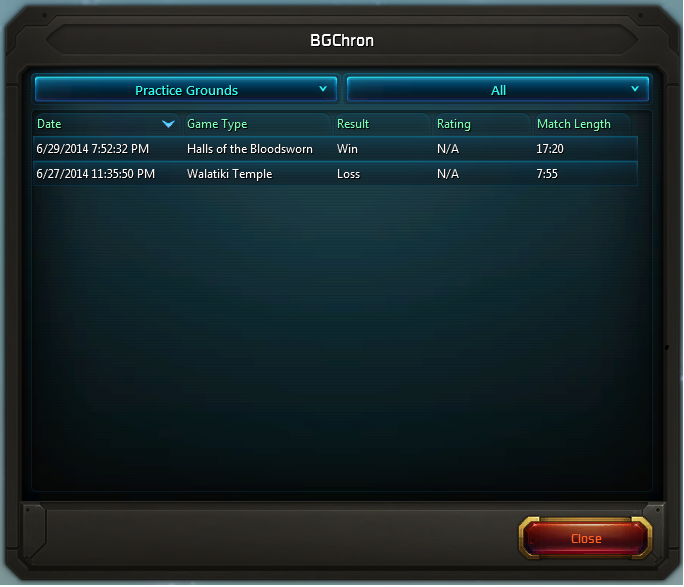 BGChron records all of your PvP matches and provides statistics based on the recorded data. Match history keeps track of all PvP matches and rating changes. If you run into any issues, please feel free to leave a comment with a description, create a problem report in "issues" on the project page, or whisper me in-game, Durina Estrellas, or Durina Estrelas (Exile). Double-click a match to view the detailed match statistics. If you left the match before the game finished then you will not be able to see details for that game. Note: BGChron is currently undergoing a rewrite, and is a part of a series of bug-fixed, performance tuned, work-alike versions of Carbine and other popular AddOns. For many players, performance in WildStar is still a big issue, and can be especially apparent when real game-play or action starts. My intent is to share what I use as a possible service to the WildStar community and authors. Authors or Carbine are welcome to reincorporate changes or ideas back into their AddOns, hoist the code verbatim into the original, or otherwise. Just let me know, and can even deprecate and link back to the original if necessary. Match History (8.28.2016) - database and settings backend have been completely swapped with a new a lightweight compressible database system, and should now be able to store hundreds of matches per character without any noticeable performance degradation or load/reload time issues. You will need to roll through and load each character that plays PvP, in order to have its settings migrate from the old per-account configuration data and not be a drag on the other characters.